India’s Polar Satellite Launch Vehicle has made its twentieth launch Wednesday morning, carrying the Megha-Tropiques atmospheric research satellite and three other spacecraft into orbit. Liftoff from the Satish Dhawan Space Centre was on schedule at 05:31 UTC (11:01 local time). Megha-Tropiques is a one-tonne satellite which will be operated as part of a joint programme between the Indian Space Research Organisation (ISRO) and France’s Centre National d’Etudes Spaciales (CNES). The spacecraft was constructed by ISRO, based around the IRS bus developed for earlier Indian satellites, and carries four instruments which will be used to study the Earth’s atmosphere. The primary instrument aboard Megha-Tropiques is Microwave Analysis and Detection of Rain and Atmospheric Systems (MADRAS), a microwave imagery payload which was jointly constructed by ISRO and CNES. 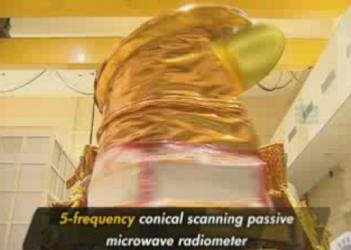 Using a conical scanning radiometer rotating at a rate of 25 revolutions per minute to scan the Earth’s surface, it provides nine channels for imagery at five different frequencies, with both horizontal and vertical polarisation at all frequencies except on the M2 channel. The M1 channels are at a frequency of 18.7 gigahertz to study precipitation over oceans. The M2 channel has a frequency of 23.8 gigahertz, with only vertical polarisation, and will be used to study water vapour. M3 has a frequency of 36.5 gigahertz, and will be used to study precipitation over seas, and water in clouds. M4, with a frequency of 89 gigahertz, will monitor convection in areas of rain, whilst M5 will use a frequency of 157 gigahertz to search for ice within clouds. Channels M1 to M3 have spatial resolutions of 40 kilometres, whilst M4 has a resolution of 10 kilometres, and M5 has a resolution of 6 kilometres. Sondeur Atmosphérique du Profil d’Humidité Intertropicale par Radiométrie, or SAPHIR, is a French instrument which is intended to study the humidity of the atmosphere. It consists of a sounder which will scan and profile water vapour within the troposphere at six frequencies close to 183 gigahertz. The Scanner for Radiation Budget, SCARAB-3, will utilise a scanning radiometer to study radiation flux in the upper atmosphere. Two previous SCARAB instruments flew aboard Russian spacecraft in the first half of the 1990s; SCARAB-1 on Meteor-3 No.7, and SCARAB-2 on Resurs-O1 No.4. SCARAB-1 operated successfully for a year, whilst SCARAB-2 was lost after just five months due to a downlink problem with its host satellite. The Italian Radio Occultation Sensor (ROSA) will be used to produce temperature and humidity profiles of the Earth’s atmosphere. 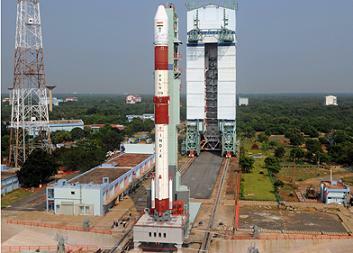 In addition to Megha-Tropiques, the PSLV will carry three other spacecraft into orbit. VesselSat-1 is the first of three satellites built and operated by Luxspace. A 28.7 kilogram spacecraft, it is equipped with two Automated Identification System (AIS) receivers. 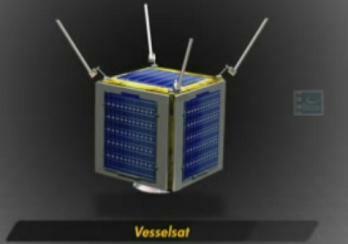 Building on technology developed by the Rubin 9.1 experimental package carried into orbit aboard a PSLV in 2009, VesselSat-1 will be used to relay identification and tracking data from ships at sea. AIS is a system used to locate, identify and track ships for the purposes of collision avoidance, traffic control, navigation and search and rescue coordination. Although ships are able to detect other vessels’ AIS transponders directly, they have a limited range, so using satellites to relay the signals makes AIS data available to users who are not in the immediate vicinity of the ship broadcasting it. VesselSat-1 is expected to be leased to Orbcomm to fill a gap caused by the failure of its five Quick Launch satellites which were deployed by a Kosmos-3M rocket in June 2008. Despite a successful launch, all five satellites developed reaction wheel problems during on-orbit testing. Within a year of launch, one of the satellites had failed completely and the rest were only partially operable, and by the end of 2010 all five spacecraft had ceased operations. The Orbcomm CDS-3 satellite launched with Quick Launch spacecraft also failed under similar circumstances. 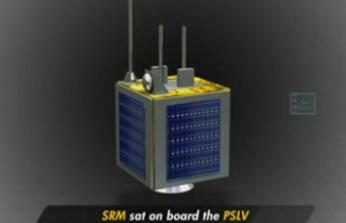 SRMSAT is a 10.9 kilogram spacecraft which was built and will be operated by the Sri Ramaswamy Memorial University. It is intended to monitor greenhouse gases within the Earth’s atmosphere, and to develop technology for future satellites to be operated by the university. The satellite will use an infrared spectrometer to collect data on the concentration of water vapour and carbon dioxide in specific regions of the atmosphere by studying their absorption spectra. The bus developed for the mission will be used as a basis for future spacecraft. Jugnu, a three-unit CubeSat built and operated by the Indian Institute of Technology at Kanpur, will be used to develop technology, and to return infrared imagery. Its primary instrument, the Micro Imaging System, will produce near-infrared images of vegetation to allow a study of land utilisation. In addition, it will test a microelectromechanical inertial measurement unit. Wednesday’s launch marked the PSLV’s twentieth flight. The rocket flew in the PSLV-CA, or Core Alone, configuration, which is the lightest variant of the PSLV. 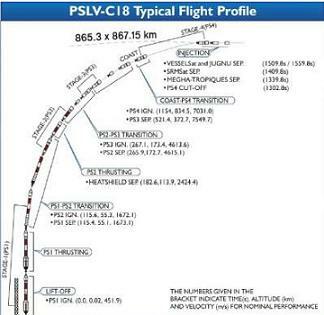 The vehicle had the flight number C18, and was the seventh PSLV-CA to fly. 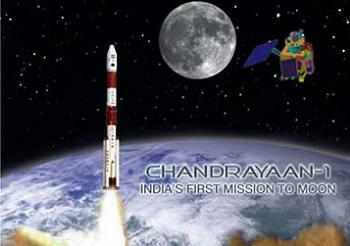 Its payload had a combined mass of 1,047 kilograms, towards the upper end of the PSLV-CA’s capacity. The first stage of the PSLV was the PS1, which was powered by an S-138 solid rocket motor. The second stage, the PS2, was propelled by a liquid-fuelled L40 Vikas engine, which burnt hypergolic propellants; unsymmetrical dimethylhydrazine and dinitrogen tetroxide. The third stage was a PS3, which was powered by an S-7 solid rocket motor, whilst the PS4 fourth stage was propelled by two L-2-5 engines, fuelled by monomethylhydrazine and oxidised by mixed nitrogen oxides. Regular PSLV rockets are augmented at liftoff by six PS0M boosters with S-9 motors, or PS0M-XL boosters in the case of the PSLV-XL, however the PSLV-CA configuration did not feature these boosters. Instead, two vernier engines were present on the first stage to provide additional attitude control. The PSLV made its maiden flight on 20 September 1993, with a failed attempt to launch an Indian Remote Sensing satellite, IRS-1E. The rocket went off course, and due to a computer error it was unable to right its trajectory, failing to achieve orbit. The second launch, which carried the IRS-P2 satellite, was conducted successfully on 15 October 1994. This was followed by another successful launch with IRS-P3 in March 1996. The fourth PSLV launch was the first to have an operational “C” flight number, rather than the development “D” designations. Although PSLV C1 reached orbit, a helium leak left the rocket, and its IRS-1D payload, in a much lower orbit than had been planned. The satellite expended most of its propellant in order to reach a usable orbit. All PSLV launches since C1 have been successful. Despite its name, the Polar Satellite Launch Vehicle has not been used exclusively to place satellites into polar orbits. On 12 September 2002, the PSLV made its first launch to a geosynchronous transfer orbit, carrying the METSAT-1 weather satellite. Following the death of astronaut Kalpana Chawla in the 2003 Columbia accident, METSAT-1 was renamed Kalpana-1. The tenth PSLV launch occurred on 10 January 2007, with the primary payload being the CartoSat-2 remote sensing satellite. Also aboard the rocket was a German student satellite, an Argentine nanosatellite, and SRE-1, India’s first recoverable spacecraft. After 12 days in orbit, SRE-1 successfully returned to Earth on 22 January. The next PSLV launch was the first to use the PSLV-CA configuration, and the first to carry a commercial satellite as its primary payload; deploying the Italian Space Agency’s AGILE astronomy satellite. In January 2008 another PSLV-CA launched Israel’s TecSAR, or Polaris, radar imagery satellite. The first launch of the heavier-capacity PSLV-XL configuration on 22 October 2010 carried India’s first lunar probe, Chandrayaan 1. Chandrayaan 1 entered orbit around the Moon on 8 November, and operated for 312 days before a power converter failure caused the mission to end prematurely; less than halfway through the spacecraft’s design life. A second PSLV-XL launch occurred earlier this year, with the GSAT-12 communications satellite. The launch of PSLV C18 will began with the ignition of the PS1 first stage upon the countdown reaching zero. The first stage burned for approximately 100 seconds, and 115.6 seconds after launch, with the vehicle at an altitude of 55.1 kilometres and a velocity of 1.7 kilometres per second, the stage separated, with the second stage igniting two tenths of a second later. Sixty seven seconds after the second stage’s ignition, the payload fairing separated from around the spacecraft. The second stage burned for 148 seconds, before being jettisoned 2.3 seconds later at an altitude of 173.4 kilometres and a velocity of 4.6 kilometres per second. About 1.2 seconds after separation, the third stage ignited to begin a 108 second burn. Following third stage burnout, the PSLV coasted for 778.9 seconds, with the third stage being jettisoned 146.3 seconds into the coast phase. After the coast was completed, the fourth stage made a 148.8 second burn to reach the final deployment orbit, with a perigee of 865.3 kilometres, an apogee of 867.15 kilometres and an inclination of 20 degrees. Thirty seven seconds after the end of the fourth stage burn, Megha-Tropiques was separated from the PSLV to begin its mission. It was followed 70 seconds later by SRMSAT, with VesselSat-1 separating 100 seconds after that, and finally Jugnu after another 50 seconds. 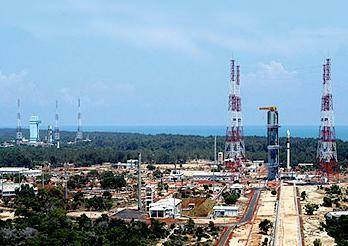 The launch of PSLV C18 took place from the First Launch Pad at the Satish Dhawan Space Centre (SDSC). SDSC has been used for every Indian orbital launch attempt, and is named after former ISRO chairman Satish Dhawan, who died in 2002. The site was previously known as Sriharikota. The First Launch Pad is the older of the two launch complexes at SDSC currently in use for orbital launches, having first been used by the PSLV in September 1993. Both the First Launch Pad and the newer Second Launch Pad are used for PSLV and GSLV launches. The launch of Megha-Tropiques was the third of four planned PSLV launches in 2011, the previous launches having successfully deployed ResourceSat-2 in April, and GSAT-12 in June. Another launch, carrying RISAT-1, is currently scheduled for December; however it is likely to be delayed until next year.